Our day of departure finally came! With great anticipation and excitement, we boarded planes from Chicago and Newark for our flight to Tel Aviv. 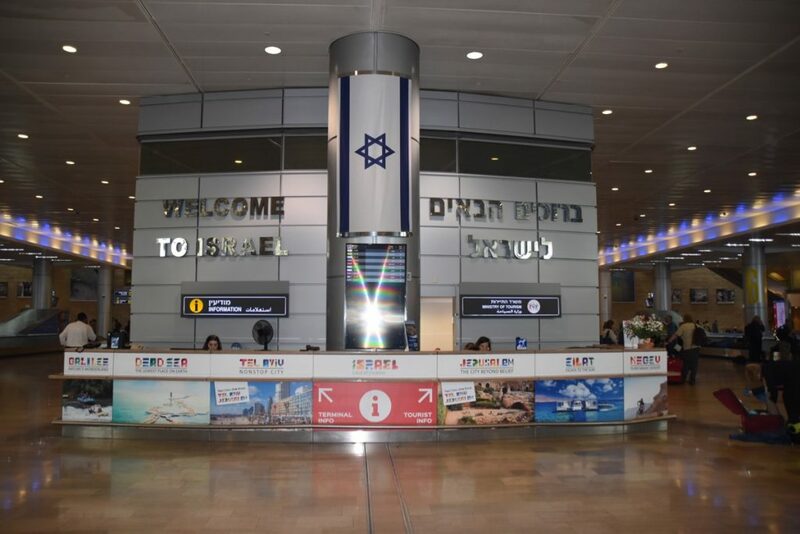 We thanks to God, we all arrived at the Ben Gurion Airport, and with no missing luggage too! Part of the group arrived last night while most in the group arrived this morning. We were met by our guides, Shlomo and Eli, as well as our drivers, David and Mashiach. The weather was overcast, with highs in the 70s. After grabbing a bite to eat at the airport, we drove to the heart of Tel Aviv, a city of about 400,000. Our first two stops were to the Palmach Museum and Independence Hall. The Palmach served as Israel’s “underground” military units. Established in 1941, the Palmach played an important role in the establishment of the Jewish State of Israel on May 14, 1948. From here we drove to the southern end of Tel Aviv to Independence Hall. It was here at this historic building where Ben Gurion declared Israel as a State. We heard the recorded words shared by Ben Gurion as well as a recording of the Hatikvah, Israel’s national anthem. This year Israel celebrates its 70th. anniversary! Before checking into our hotel, we also made a brief stop in Jaffa/Joppa. It was from here where Jonah sailed (Jonah 1). It was also here where Peter performed miracles (Acts 9) and where he had his “vision” that led to the expansion of the kingdom of God to Gentiles (Acts 10). We walked the quiet alley ways of Jaffa. The view of the coastline of Tel Aviv was very nice from here as well. To end the day, we drove to our hotel located along the Mediterranean Sea. Following check-in and dinner, we enjoyed an orientation meeting to help us prepare for the next 12 days together. It is great to be in Israel, the land of the Bible, and we are looking forward to what God has in store for us! Today was our first full day in Israel. We were greeted with mild temps, with highs in the 70s. The morning was overcast (with a few brief showers), but the afternoon was partly sunny. Leaving our hotel along the Med Sea in Tel Aviv shortly after 7:30, we drove to the Shephelah (lowlands of Judah). We would spend the entire day here. Tel Gezerwas our first stop. Located along the Aijalon Valley, this archaeological site connects us to both the ancient Canaanites and Israelites. We read from Ecclesiastes 3 (“there is a season for everything) and I Kings 9 (about Solomon refortifying the city). Among the ruins we saw the Canaanite tower, wall, 6-chamber gate, and the water system. From the Israelite period we saw the 6-chamber gate attributed to Solomon. We even saw a replica of the Gezer Calendar discovered about 100 years ago here. Leaving the site we saw the standing stones of Gezer, most likely part of the Canaanite cultic practices. Driving south to the Sorek Valley, we made a brief stop at Beth Shemesh. Reading from 1 Samuel 6 about the return of the Ark of the Covenant from the Philistines, we could see this incredible story come to life! Samson was also from this area (Zorah). Although he married Delilah (from Timnah just a few miles west in the valley), God used him in amazing ways! Continue south to the Elah Valley, we made a brief stop at Gath(Tel es-Safi). This was where Goliath was from. We also read from 2 Kings 12 about Hazael, the Aramean, who surrounded and conquered this city. Here we saw some of the lower ruins of the city. One of the newest archaeological sites is Kh. Qeiyafa. This was our next stop. Standing inside one of the city’s two chamber gates, we had a great view of the Elah Valley below. This was where David defeated Goliath. Reading from I Samuel 17, we took great joy in knowing that God helps us fight our battles of life when we entrust the difficult circumstances of life to His sovereign care. Passing by many of the ruins and casemate fortification wall, we exited through the other chambered gate. It is possible that this site was Shaaraim of ! Samuel 17:52. After eating lunch, we visited Beit Guvrin. This was our first national park. We walked to two caves. The first was the columbarium (designed for raising pigeons). The second was one of the bell caves. Here we listened to Shlomo share a song on his recorder. We also blended our voices together with two worship songs. The acoustics were fantastic! We also read form Micah 1 and 5 as this prophet was from this city (formerly called Moreshah). Our last stop was Lachish. This was both a Canaanite (conquered by Joshua in two days, see Joshua 10) and Israelite city. In the late 8th century BC, the city was conquered by the Assyrians. Over 100 years later, the Babylonians came and destroyed the city for good. We read from Jeremiah 34:7, a text that matches perfectly with what one of 20 ostraca (Lachish Letter #4) said. Climbing the site, we saw the double walls and gates as well as the palace (probably built by Rehoboam, see 2 Chronicles 12). Following a drive of about 50 minutes, we arrived in Beersheba, the primary city of the Negev. We checked into our hotel and enjoyed dinner. We also met briefly for a time of worship. Today was a very nice day here in the Negev, with sun and temps around 80. Leaving the hotel shortly after 7:30 following a great breakfast, our first stop was close by. Tel Beershebais the small and concise archaeological site, but filled with exciting things to see. At the well of the city, we read from Genesis 21 about Abraham making a treaty here and digging a well. Even though the well doesn’t date to Abraham’s time, it is still amazing to think that he (and Isaac, Jacob, Elijah, and others) were here! We also referred to Psalm 126 (that mentions the “water courses” of the Negev) and Psalm 23 (about the “cup” that runs over). The ruins date primarily to the days of Solomon to the 6th century BC. We saw the gate, “four-room Israelite houses,” and a storehouse. We exited the site by walking down through the most impressive discovery of the site, the water system. Driving south through this arad Negev we arrived at Sde Boker. This is where David and Paula Ben Gurion are buried. Their grave overlook the spectacular Zin Desert. Here we also saw a few ibex (Psalm 104). Driving down into the canyon, we all hiked back to the water falls. The scenery was stunning! Many in the group also hiked up to the far rim of this canyon (ascending about 500 feet) while others returned back to the bus. After the bus picked up the “hikers,” we visited a Nabatean city called Avdat. The Nabateans were a desert people who established a trade route in this area (their main city was Petra in Jordan today). Here we saw many ruins, including a couple Byzantine churches built later in the 5-6th century AD. We also ate lunch here. Our last site of the day was Arad. Located in the NE corner of the Negev, this site began as a Canaanite city, later established as a Judean city on the citadel of the city. Overlooking the false worship center here, we read from 2 Chronicles 34 about Josiah’s reforms of the land. 100 years earlier Hezekiah similarly brought an end to these idolatrous actions. Standing in the temple itself, we remembered the words of Paul (from Romans 12) about how God wants us to be a living sacrifice to Him. Driving east through the modern city of Arad, we arrived at our “Bedouin hotel” called Hanokdim located in the Judean Desert. We first enjoyed a 30 minute camel ride out into the desert. Following a traditional bedouin dinner, we enjoyed listening to a Bedouin woman talk about her lifestyle and customs. We also enjoyed a time of fellowship around the fire. As the stars shone brightly, we remembered the promise given to Abraham (Gen. 15). We retired to our “tents” for the night. This is a unique place! The entire day today was spent in the Judean Desert on the western side of the Dead Sea. It would be a sunny and warmer day, with highs in the upper 80s. Following a early rise from our “Bedouin tents” and breakfast, we drove just about 6 miles east to Masada. As we approached this famous Jewish site, we read from Psalm 18:1-2 where “metzada” is mentioned as the Hebrew word for “fortress.” Upon arriving, most in the group hiked the Roman ramp to the top, while a few others drove around to the eastern side and took the cable car to the top. Masada was one of Herod the Great’s “palace-fortresses” that was later used (after 70 AD) as a place of refuge for about three years for 967 Jews. On top we saw a few massive cisterns, the western palace, the casemate wall, the synagogue, and a glimpse of the northern palace. Since they were working on restoring the Snake Path from last weeks unusual flash floods here, no one could walk down. So we all had to take the cable car to the bottom. Driving only about 15 minutes north, we arrived at Engedi. Most in the group walked up the canyon while others visited the Talmudic 3rd century AD synagogue. We read from Songs of Songs 1 (“henna blossoms of Engedi”), 2 Chronicles 20 (“Ascent of Ziz”), and 1 Samuel 24 (the David and Saul “cave encounter”). Hiking up to the water falls, some enjoyed getting wet in the natural springs that flow here all year long. Continuing to drive north about 30 minutes, we came to Qumran. This is no doubt the most significant archeological site in Israel. A number (25?) in the group got dropped off for the hike to “Cave 1” (where the first Dead Sea Scrolls were found in 1947), while others ate lunch at the visitor center. We also visited the site of Qumran where we saw many mikvot (ritual baths), the scriptorium, and cisterns. In front of Cave 4 we paused to rejoice in the preservation of God’s Word. We also read from “Psalm 151” (humbly written by David). It was found in Cave 11 in 1956. Changing our itinerary a little, we made a brief stop to see the Jordan River. The site located across from Jericho is called Qasr El-Yahud.According to John 1, Jesus was baptized near here. While the water is very muddy, many Catholics and Greek Orthodox come here for baptism. We ended the day with a float in the remarkable Dead Sea. It contains 33% salt and minerals. Most in the group enjoyed the uniqueness of the float. Some even enjoyed the black mud! It was a wild experience! Close by was our kibbutz-hotel called Al Mog. We enjoyed dinner together before retiring for the evening. Today we drove north to Galilee. On the way through the Judean Desert, Hill Country of Samaria/Ephraim, and the Jordan Valley, we saw some great sites that again connected us to the Bible. It was another sunny day, with highs in the 80s. Our first site was Jericho. Climbing to the top of the site, we first looked east towards Mt. Nebo. This is where Moses died (Dt. 34). Elijah and Elisha also had ministries in this area. Looking about 2 miles south we could see “New Testament” Jericho (where Zacheaus and Bartimeaus were from (Luke 19, Mark 10). Herod had his winter palace here. He also died here. Yet it was this Old Testament Canaanite site that Joshua conquered. We read from Joshua 6 as we saw the very retaining walls that Joshua saw! It was on top of this stone wall that a mud-brick wall was placed. It was the mud-brick wall that came tumblin’ down! We praise God for the reliability of Scripture and how archaeology confirms the biblical record! Driving west towards Jerusalem, we cut off the main road for a panoramic view of the Wadi Qelt. Here we heard the words of Isaiah 40 from “the prophet.” This Judean Desert was the context for these words of hope and promise. John the Baptist would echo these same words! Shlomo also sang Psalm 23 for us as well. Continuing our drive through the Desert of Pareth (Jeremiah 13) and past Michmash (I Samuel 13-14) and Bethel (Genesis 12 and 28), we arrived at ancient Shiloh. It was here where the Tabernacle and the Ark of the Covenant was located until the Philistines took the city (1 Samuel 4). We read about the call of Samuel that took place here (1 Samuel 3) and Jeremiah 7 about this place. Before leaving, we walked down to the flat area of the site where most suggest the Tabernacle was located. Continuing our drive north through the Samaritan hills, we saw lots of shepherds along the way. We arrived at Beth Sheanfor lunch and to visit this huge archaeological Roman site. We saw the bathhouses, the pillared streets, the agora (market place), many mosaics, the public latrine, and the impressive theater. Some climbed to the top of the OT site of Beth Shean were Saul’s body was hung after he died on M.t Gilboa close by (1 Samuel 31). Driving about 30 minutes north to the Sea of Galilee, we arrived at our hotels. One is located on the southern shoreline of this “lake,” while some are staying on the NW corner in Tiberias. We enjoyed dinner together and a free evening. Today was entirely spent in the Sea of Galilee area. From the southern end to the northwest corner, we retraced the life and ministry of Jesus today. The weather was once again wonderful, with full sun and highs in the 80s, with an afternoon breeze. Following breakfast, we drove to the cliffs of Arbel. This is a high 800 foot cliff that overlooks the NW corner of the Sea of Galilee. About 30 in the group hiked to the top, while others bussed around from the other side and walking about 400 feet to the top. What a fabulous view from here! Matthew 13 (kingdom parable of the seed) as we saw all kinds of vegetation, including the thorn thistle. Driving to the southern end of the lake, about 25 in the group were baptized in the Jordan River at a place called Yardenit. It was a special time of reaffirming our faith-walk with Christ. The water was warm and we had the place to ourselves. Driving back north along the western shoreline, Magdalawas our next visit. This was a prominent 1st century city during the times of Jesus. A certain follower of Jesus, Mary, was from here. We saw the 1st century synagogue here (only one of about seven that date to the time of Jesus have been discovered so far), and we could picture Jesus teaching from the middle of this one! Following a wonderful “fish” lunch, we drove to the NW corner of the lake to Chorazin. Here we saw a 3rd century synagogue, along with the “Moses’ seat” that was discovered here. We read from Matthew 23 that mentions it. This city was one of three condemned by Jesus because of their unbelief (Bethsaida and Capernaum were the other two, see Matthew 11). Located down along the shoreline, Capernaumwas our next stop. This major city served as Jesus’ “home base” for his ministry. Sitting in the 5th century synagogue (under which was the 1st century one), we read from many of there Gospel accounts of Jesus being here (Mark, 1,2, and 9; Luke 7 and 8; John 6). Jesus displayed his s’mekah (authority) here as well as his compassion and healing. We also considered that it was probably here where Jesus called at least five of His disciples (Mt. 4). Driving to Nof Ginnosar, we enjoyed seeing a 1st century ancient wooden boatthat was discovered in 1986 by two brothers from the kibbutz here. This was followed by our own “boat ride” out on the lake. We enjoyed a time of worship, Scripture (Mark 4, Matthew 14), and reflection as we remembered Jesus’ words, “Peace, be still.” What a promise when we encounter our own “storms” of life! Our last stop of the day was to the Mt. of Beatitudes. This was where Jesus taught a message about the kingdom principles. It’s called the Sermon on the Mount (although this was probably Jesus’ “go-to” message elsewhere as well (see Luke 7). We heard Matthew 5 in both Hebrew (as it would have been spoken by Jesus) and in English. Most in the group walked down to the water’s edge to end this experience. We returned to ur hotel for dinner and another free evening. Today we headed north to the Golan Heights. Other than a brief time of showers around noon (unique for this tie of year! ), the rest of the day was sunny, with comfortable temps in the high 70s. Driving to the northern tip of the Sea of Galilee, we unsuccessfully attempted to reach the new possible site for Bethsaida, El Araj. To get to this site we took a dirt road through a field. We got stuck in the mud however. Fortunately, after everyone unloaded, we were able to back up and return to the main road. So ascending the Golan Heights, we stopped at a place that offered a panoramic view of Bethsaida below. We read from Mark 8 and John 6, two stories that took place here. Driving to the plateau of the Golan, Gamlawas our next stop. This was a Jewish city that was taken at the time of the First Revolt (66 AD). Josephus mentions the battle because he was here when it took place against the Romans. From the overlook above the site, we could see the city walls, the towers, and the 1st century synagogue. Even though not directly mentioned in the Gospels, Jesus must have taught here. We also saw a Griffon vulture. They are protected here. Further north is the Talmudic village called Katzrin. Here we sat in the reconstructed stone house of Rabbi Abun. Houses in the 1st century must have been very familiar to this one. We read from Mark 2 from within the house. The story came alive! Here we also saw the ancient synagogue dating around the 3rd – 7th centuries AD. As it began to rain a little, we drove to the top of a extinct volcano developed by the Israelis as a military outpost after the 1967 war. It is called Bental. On top we heard about the 1967 and 1973 wars and about the modern situation with Syria. The border of Syria is only a few miles away! The clouds finally broke to allow us to see miles into Syria and the town of Kuneitra. Even with the Iranian rockets shot at Israel a few days ago (none reaching Israel), we were safe and with no concern. After picking up bananas and cherries for lunch for everyone, we began our descend down the Golan Heights. On the way, Mt. Hermon came into full view (Psalm 133). Before descending all the way, we visited Caesarea Philippi. This was a city developed by Phillip, one of Herod the Great’s three sons. We read from Matthew 16 about the question Jesus asked of His disciples in the region of this city, “Who do you say I am?”Among the ruins at the grotto, we saw the evidences of how how pagan this city was during the days of Jesus (e.g. Temple of Augustus, niche of Pan, dedication of Nemesis, pit of the dancing goats, etc…). One of the three tributaries of the Jordan begin here, the Banias Spring. Nearby is the site of Laish/Dan. We first walked along another tributary of the Jordan, the Dan Spring, as we made our way to the archaeological ruins. Along the way we stopped for a brief stop to listen to Shlomo play his recorded and to read and sing Psalm 42. At the archaeological site, we saw the location of the altar and we sat on the steps of the high place. We read form Judges 18 and 1 Kings 12 about the pattern of disobedience developed here. We also looked into Lebanon and heard about the current situation with this country. Leaving the site we saw the Middle Bronze/Canaanite mud-brick gate. On our way back to the hotel, we visited Omrit. Walking about 15 minutes to the site, we saw the massive stones placed by Herod the Great in honor of Caesar Augustus. Some suggest that this served as a monument to Augustus, while others suggest there was actually a temple but here in honor of Augustus. Omrit is certainly a site not visited by many other groups. We returned back to our hotel for a late dinner and a free evening. It was a long but another great day here in Israel! Today we checked out of our hotel in the Galilee. Leaving shortly after 7:30, we headed to our first site on what would be another very nice day (with a mix of sun and clouds, good visibility, and temps in the high 70s). Located in the Lower Galilee, Sepporiswas our first site. This was a huge Hellenized Jewish city in the time of Jesus and served as the capital city of the region. Here we saw beautiful mosaics, including the Nile and Mona Lisa of the Galilee mosaics. This was a cute that flourished through the Roman period. We also saw a small theater. Even though not mentioned in the Gospels, Jesus must have visited this city, especially while growing up only 5 miles away in Nazareth. Close by is the city of Nazareth. It is predominately an Arab city (who are Israeli citizens) of about 80,000 today. Driving through the edfe of this city, we arrived at the Precipice of Nazareth. Here we enjoyed our first of three views of the Jezreel Valley. We saw Mt. Tabor (Judges 4-5), the Hill of Moreh (Judges 6-7), Mt. Gilboa (1 Samuel 31), and Mt. Carmel (1 Kings 18). We considered the story of Luke 4 (Jesus teaching in the Nazareth synagogue) and John 1. We were invited to “come and see” Jesus anew. We also enjoyed a time of worship and reflection here as well. Driving across the Jezreel Valley, we visited Megiddo. This is an archaeological site that has over two dozen levels of occupation over a 2,500 year period (from Early Bronze to Israelite). Climbing the tel (ancient mound), we saw three gates complexes( from both the Canaanite and Israelite time period), Solomon’s stables, a Canaanite stone altar, and a grain bin (9th century BC) among other things. Looking out upon the valley (Armegeddon) we recalled Revelation 16 and celebrated that God has the final word in the end times! We exited the site through the water system. Following lunch at a place owned by Druze, we made a brief stop at Muhraka. Here we gathered in a small chapel and read from Isaiah 35, Song of Songs 7, and 1 Kings 18. It was here God displayed His power and glory to Elijah. We enjoyed singing in the chapel too! The roof of the chapel provided us a marvelous last view of the Jezreel Valley below. Our last stop of the day was Caesarea. Tis was another huge city built by Herod the Great in 22 BC. Sitting the the theater, we read from Acts 10, 12, 21, and 26. Both Peter and Paul proclaimed their faith boldly here! We also saw the palace and hippodrome. Before leaving the site, we enjoyed seeing the aqueduct that was used to bring water into the city from the Carmel Range. From here was drove about 2 hours to Jerusalem. Traffic was heavy heading into this capital city of Israel. We checked into our hotel, enjoyed dinner and then an optional walk to the Western Wall. It is both exciting and historic to be here for Israel’s 70th Anniversary tomorrow and the moving the the US Embassy to Jerusalem! Today is an historic day here in Jerusalem. It is special to be here the day that the US Embassy officially moves to Jerusalem. It would be another sunny day, with highs in the 70s. Leaving the hotel around 7:30, we drove around the Old City to the Mt. of Olives. Here we enjoyed a panoramic view of the City of David (to the south), the Temple Mount, and entire Old City below. We read from Luke 19 (Palm Sunday), and Zechariah 14 (Christ’s Second Coming). We celebrated Christ as King! We walked down this western slope of the Mt. of Olives to an area designated as the Garden of Gethsemane. In full view of the Eastern Gate (Ezekiel 44), we pondered the words of Jesus, “not my will but yours be done…” from Luke 22. These were words that displayed Jesus’ willingness to endure the cross. Walking down to the Kidron Valley and then back up to the St. Stephen’s (also called Lion’s and Jericho Gate), we entered the Old City. Our first stop was the St. Anne’s Church. It was a Crusader Church with wonderful acoustics (an 8 second echo). We sang a few songs, with Ruth sharing a special song as well. On the same grounds are the archaeological ruins of the Pools of Bethesda. This is where the paralyzed man was healed by Jesus (John 5). Built over these ruins were Late Roman and Crusader churches. Walking the Via Dolorosa (the “way of the cross,” even though Jesus carried the cross from the opposite direction), we arrived at the Holy Sepulcher Church. It was built in the 4th century AD. This location serves as one of two suggested sites for the crucifixion and burial of Jesus. Inside the Edicule is the suggested actual tomb of Jesus. Close by in the Christian Quarter we ate lunch. Walking out of the Jaffa Gate, we met our bus and drove to Herodium. This is an archaeological site excavated for over 35 years. It was a palace-fortress of Herod the Great. While this Judean king died in Jericho in 4 BC, he was buried here. We climbed to the top of the site where we had a wonderful view of the area. To the north we could see Jerusalem; to the east the Judean Desert and the Dead Sea; to the south the village of Tekoa; and to the west Bethlehem. Among the ruins we saw were the towers, the synagogue, the bathhouse, and the cistern system. Driving to Beat Sahour, we visited the Shepherds’ Fields. Gathering in a cave, we considered the role of the shepherd in biblical days. We read from Micah 5 and Luke 2 about the birth narrative of Jesus. Also before leaving we enjoyed singing a few carols in the Chapel of the Shepherds. We sounded angelic! We ended the day in Bethlehemat an olive wood shop and store. The store is owned by Palestinian Christians. Bethlehem is known for its olive wood carvings. We enjoyed some shopping here. We returned back to tour hotel. We passed close to where the new Embassy is now located. Following dinner, we went to Ben Yehuda Street for a little taste of modern Israeli culture, shopping, and ice cream. We walked back to the hotel. This morning was an early start here in Jerusalem. With breakfast at 6 a.m., we departed shortly after 6:30 because of the early reservations made for the Western Wall Tunnels. We enjoyed the sun and perfect temps (mid 70s) once again. The day would also be a lighter day, with some free time. Visiting the Western Wall was special. Here we saw many Orthodox and Ultra-Orthodox Jews gathered at the Wall for morning prayers. In three groups, we saw more than just this part of the exposed Wall. We entered into the Western Wall Tunnels and walked parallel to this western retaining wall about 400 yards. Here we saw huge stones on the Temple placed by Herod the Great, a project he began in 20 BC. One stone, called the Master Course, weighs several hundred tons. For sure, the Temple was the most extensive building project in the ancient near eastern world at this time! Up to the time of Jesus, the temple was already in its 46th year of building (John 2). After returning to the Wall for more time here, we walked out of the Dung Gate and boarded our bus for the short drive up the hill to the Peter Gallicantu Church. This is the traditional location for the house of Caiphias, the High Priest who bound Jesus (Luke 22). After visiting the church, we descended further down the slope. The most impressive thing to see here was the stone steps dating to the 2nd Temple period. These set of steps would have connected the upper city with the lower city of Jerusalem. Jesus would have used these steps! We also saw a model of Byzantine Jerusalem. From here we drove to western Jerusalem to Israel’s Holocaust Museum & Memorial called Yad Vashem. We first visited the Valley of the Communities, highlighting all the cities and towns throughout Europe effected by the Nazis. Both Eli and Shlomo shared their personal stories. In the visitor center we ate lunch, followed by walking through both the Childrens’ Memorial (1.5 million children were killed), and the museum itself. Along all the pathways are trees planted in memory of the righteous Gentiles who saved Jews during WWII. Certainly, this place is a difficult yet important place to visit. Leaving Yad Vashem, we drove back to the hotel. Many on both buses got off at the Jaffa Gate for some free time in the Old City. Some walked on the ramparts (Turkish walls of the city), gaining a unique perspective of the city and people below. Returned to the hotel for dinner and a free evening. This morning we began the day early again because of our visit to the Temple Mount. So with breakfast again at 6, we left the hotel shortly after 6:45. Today would be once again sunny but warmer, with highs in the 80s. We arrived in the Old City and walked through the Dung Gate shortly after 7 a.m. Here we entered through the security area that leads up to the Temple Mount. All was quite quiet on the Temple Mount as we heard about the history of this very sensitive area today. It was here both the 1st and 2nd Temples once stood. We saw the El Asca Mosque (built in 710 AD),the Dome of the Rock (built in 691 AD), and the inside of the Eastern Gate (Ezekiel 44). We also remembered the story of John 7 involving Jesus and the Water Libation Festival. Leaving the Temple Mount we walked to the Jewish Quarter. Here we entered a fascinating “underground” excavation called the Herodian House. We saw massive house structures, mosaics, ritual baths, and frescos that al date to the 1st century! This was a Jewish house that was destroyed by the Romans in 70 AD. Next, each group had the opportunity to enter into the Shorashim shop and listen to Moshe (an Orthodox Jew) who shared about his Jewish faith and practice. Others climbed the 180 steps of the spiral staircase leading to the top of the Redeember Lutheran Church tower. Others enjoyed a time of shopping and wondering around. We all ate lunch here in the area. Walking out the Zion’s Gate, we boarded our bus and drove to the Temple Mount Sifting Project. After listening to a brief lecture about the endeavor, we enjoyed “wet-sifting” through the debris brought from the Wilson’s Arch area of the Temple. Among the many pieces of pottery, bones, and mosaic stoneswe found, two in the group found a coin! It probably dates to the 1st-2nd century AD! Our last stop of the day was the Israel Museum. Here we saw three things – a 1:50 scale model of Jerusalem looked like in 70 AD, the Shrine of the Book museum, and because to limited time, the highlights of archaeological wing of the museum. Each of these continued to help us connect the dots with the archaeological world and the Bible. We drove back to our hotel for dinner and an optional walk to the southern Promenade of Jerusalem. Can’t believe we just have one more full day here in Jerusalem! Leaving at 7:30 following another full breakfast, we arrived at the southern excavationsof the Temple. It was amazing to see the magnificence of this temple, especially in light of one massive stone placed upon another. No wonder the disciples were equally amazed (Mark 13, Luke 21)! At the SW corner we walked on a Herodian street no doubt used by Jesus too! We also saw the massive stones toppled by the Romans in 70 AD. On the southern end, we walked up the temple steps. We reflected upon who all used these steps during the time of Jesus and the apostles. Above us was the royal stoa. On the east side was Solomon’s Porch (John 10, Acts, 3, 5). We also remembered Acts 2. Perhaps Peter gave his stirring testimony here (Acts 2). The majority of the group flew back today. Some flew out at about 9 am, while others fly out shortly after noon. Praise be to God for a life-changing experience!